How to throw a boomerang? 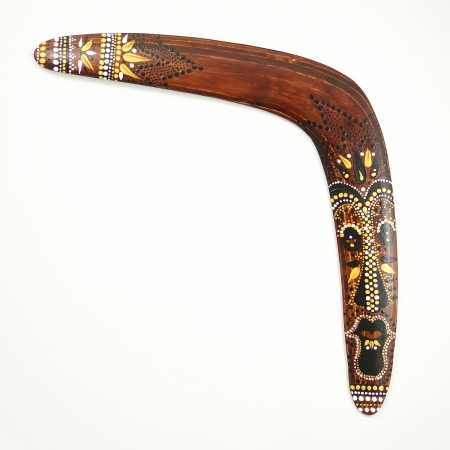 • Traditional type wooden boomerang. Throw it & it Returns! • Handcrafted of the best quality Aircraft Grade Baltic Birch Plywood. 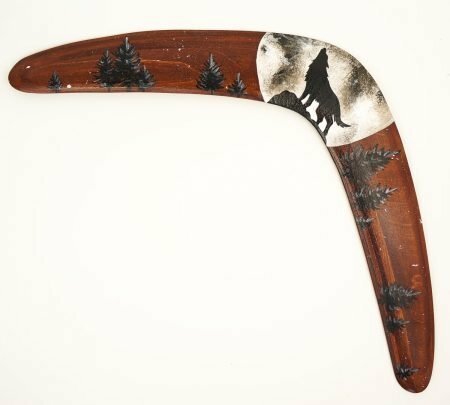 • The artwork on the boomerang is hand painted by professional artist. • Long Accurate Flight. Boomerang is fight-tested and caught before sold. • Distance maximum of the flight, 90 to 100 feet. • Includes “How to Throw Boomerangs” STEP by STEP instructions. 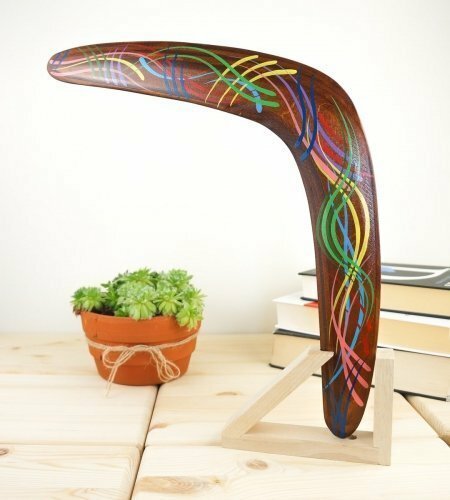 • Can be a great wooden gift for various occasions (for example, like a birthday gift for an adult or teenager). Boomerang is handcrafted by me and is made of the best quality Aircraft Grade Baltic Birch Plywood. It is fight-tested and caught before sold, therefore I can guarantee it is returning. Edges are smoothly sanded and polished in order to achieve better aerodynamic characteristics. 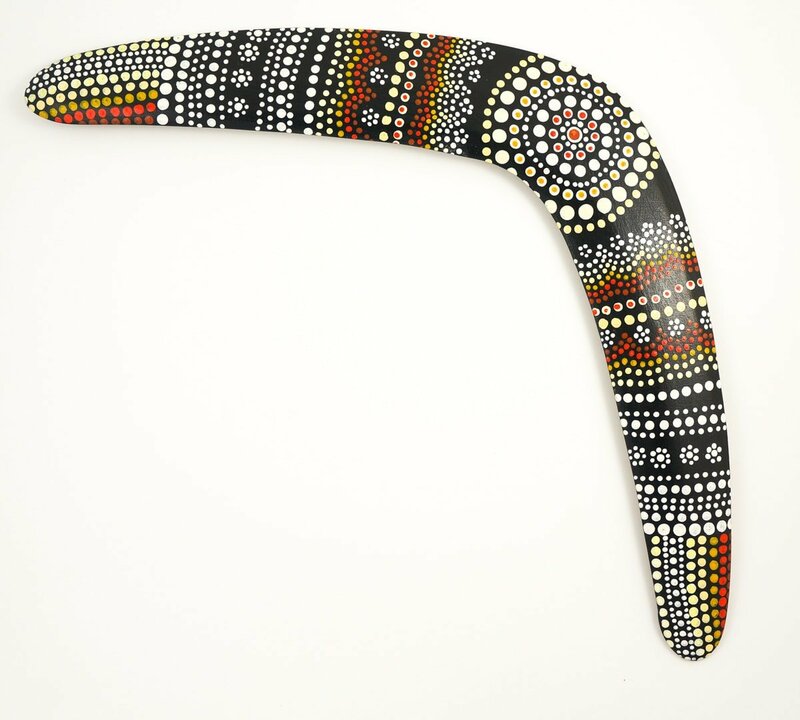 The artwork of boomerang is made by professional artist (my lovely fiancee paints it ☺ ) and done completely by hand. 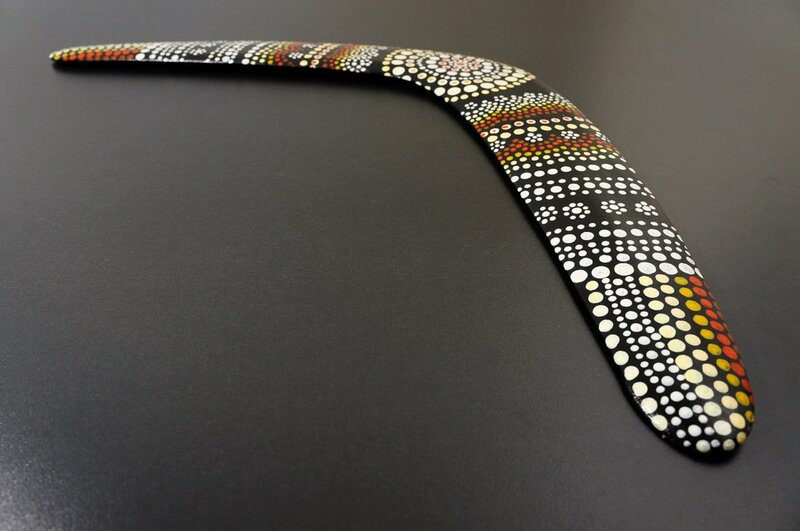 Both sides of the boomerang are protected by few layers of acrylic lacquer, so it’s highly resistant to scratches and damages. 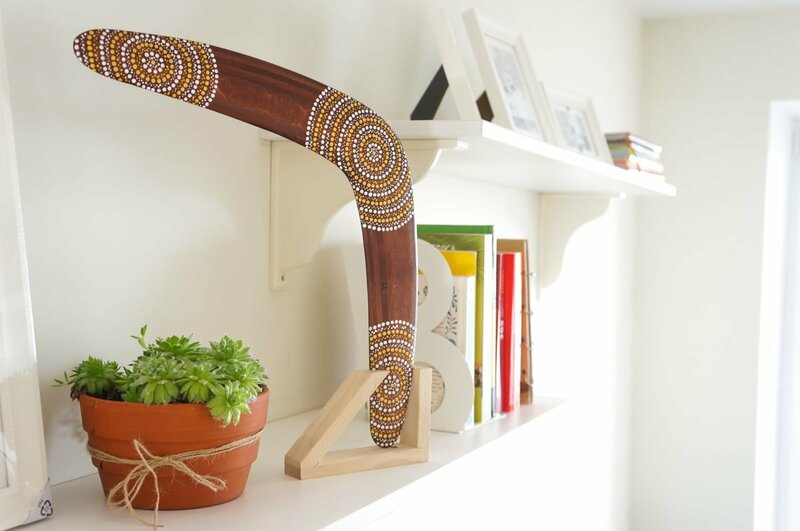 Boomerang can be a great wooden gift for various occasions (for example, like a birthday gift for a man or teenager). Also, it is a wonderful piece of art, which can be hanged on the wall right after playing with it outdoors. It’s ALWAYS impressive how a wooden stick without modern technologies can fly, makes a big circle in the air and then accurately comes back to your hands! 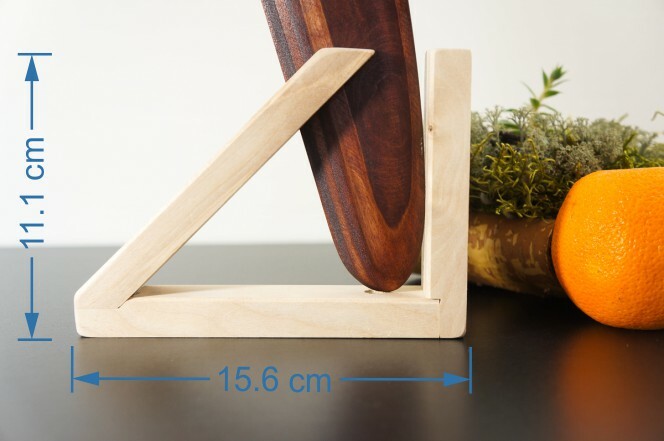 Beautifully crafted wooden stand is made from solid wood. 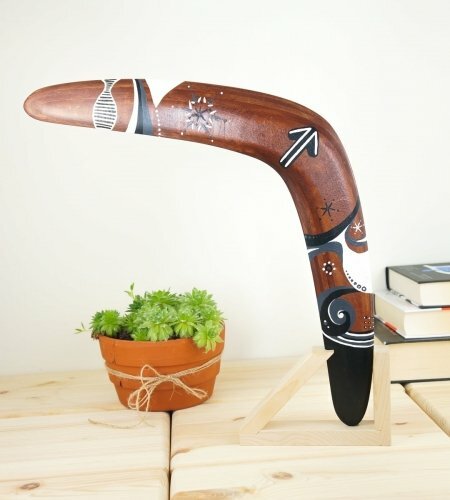 It is the ideal accessory for holding a boomerang on a desk or shelf. At the beginning, I will prepare few sketches for you. 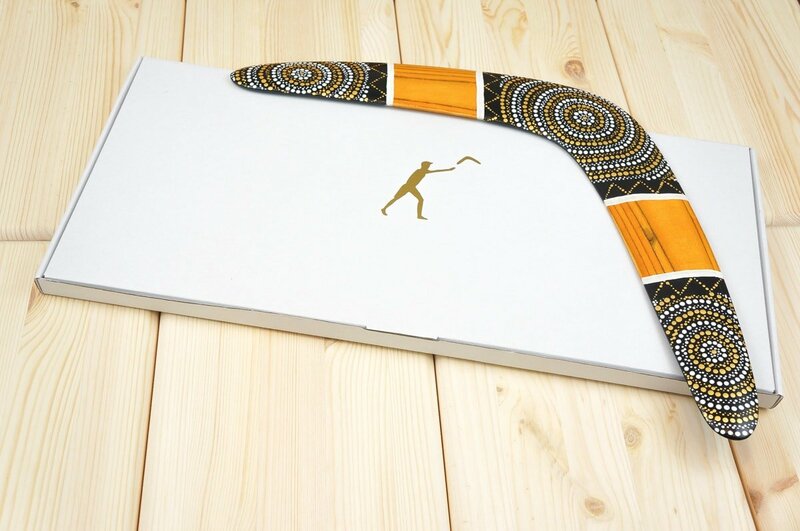 As soon as you confirm the sketch, I will start to engrave the boomerang. 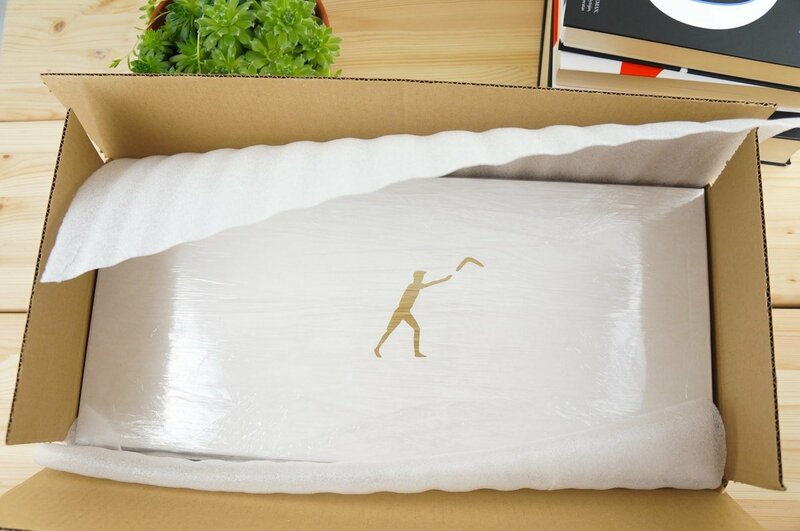 If you checked “Gift Box” option, the boomerang will be putted in White/Brown gift box and then packed to the shipping box. No order information will be included in the shipment. 1. 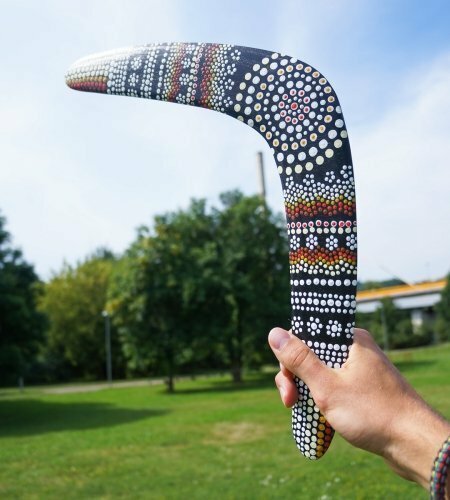 How to throw a boomerang? 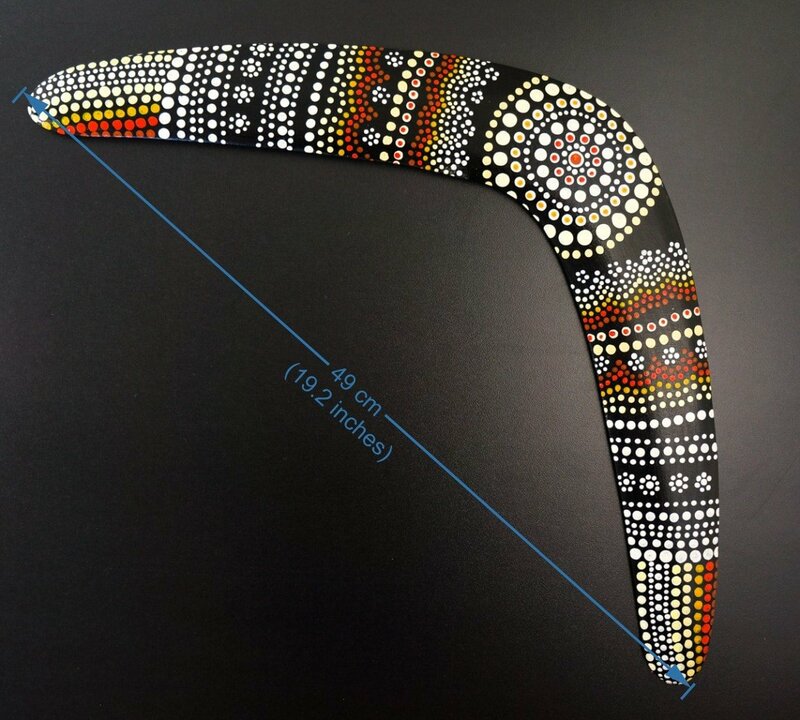 – Safety tips and STEP by STEP throwing instructions for Right hand and Left hand throwers are included with each boomerang. You should read it before the throwing. 2. Is it safe to use it for 10 years old boy? I recommend it for adults or at least 12 years old children with adult care. Great product and amazing customer service. Thanks ! 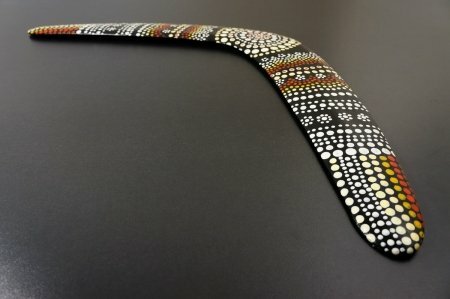 Amazing Boomerang!My best man loved it as a wedding gift however his wife won’t let him use it because it is so beautiful.She wants him to hang it on the wall.Also can’t say enough about the service provided despite my procrastination.He managed to get it to me with time to spare.Love the item and the service! 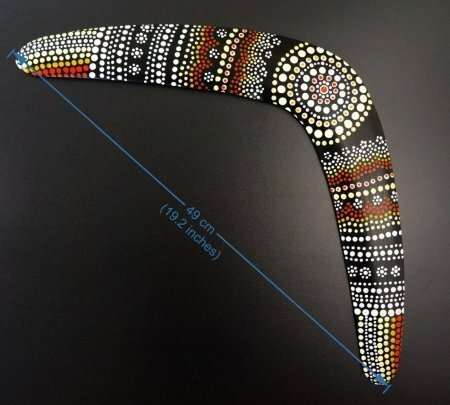 This boomerang is absolutely stunning, and it works great! 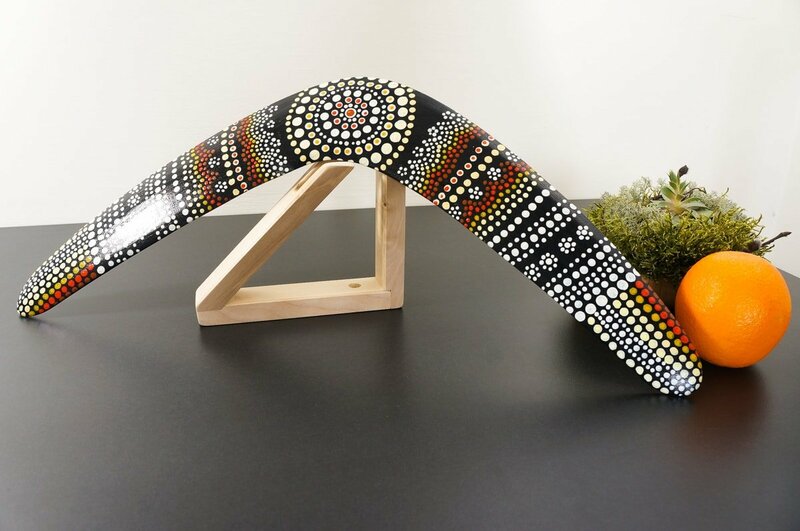 You can tell it’s hand-painted and a lot of care goes into making this item. The owner also helped me out incredibly quickly when I contacted him about upgrading to faster shipping. And yes, it does take some practice to learn how to throw. Follow the instructions provided, make sure it’s not too windy, and have fun! Wonderful customer service, great product, would definitely recommend! 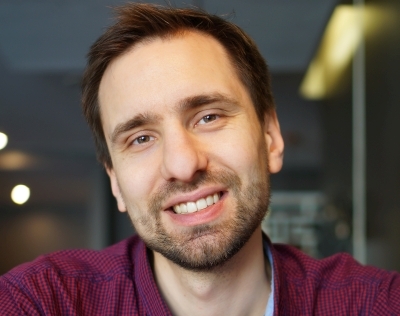 Genuinely, I wish I could give Nemunas and his work way more than 5 stars!! 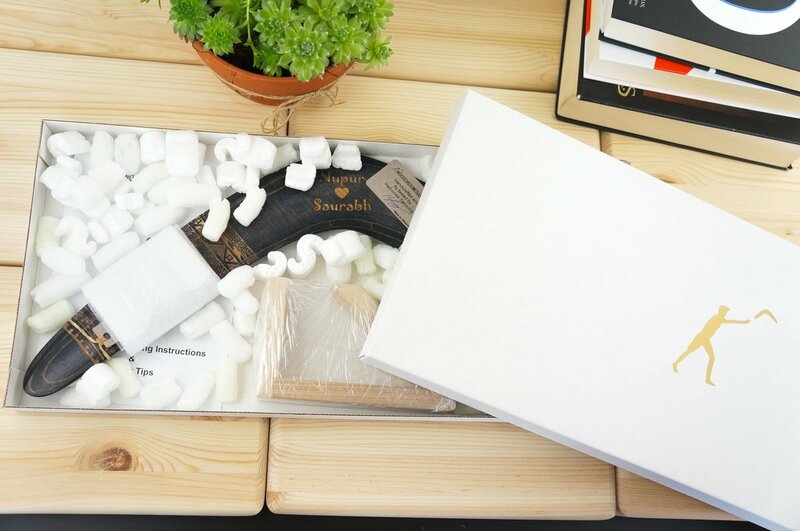 His level of service and the care he puts into his products is above and beyond fantastic– truly the best I have ever received. 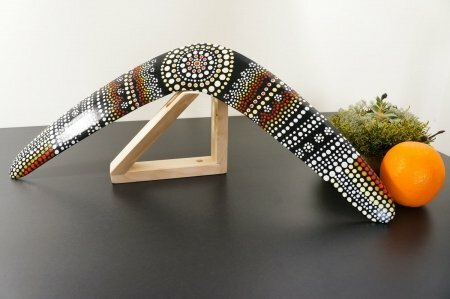 I appreciate his beautiful creations, and I would recommend that anyone who is thinking of buying a boomerang to not look any further, as Nemunas’ shop is where it’s at!! I’m keepin’ mine in a special place for the rest of my life =] Thank you, thank you. I absolutely adore the boomerang I received! I really liked it. It’s very pretty and carefully crafted. It is a Christmas present and we haven’t tried it yet, but, I will feel very confident this year when my husband opens it. It also came to Asheville USA from Lithuania very fast. Other countries - 3 to 4 weeks. Other countries - 3 to 4 days. 100 % Money back guarantee. More info here.